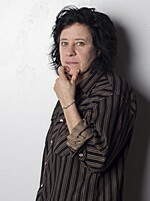 To say that Thalia Zedek is busier than ever right now might be a bit of an exaggeration, but there's no denying that the American singer and guitarist, who first made a name for herself in the late 80s as the singer of the New York noise rock experimentalists Live Skull, has entered a very fruitful period of her career. Last year, she not only reunited with her 90s band, the blues-infused Boston indie rockers Come, to tour in support of their reissued 1992 debut masterpiece Eleven: Eleven (Matador), she also released what might be her best solo album to date, Via (Thrill Jockey), on which she perfectly balanced the electrifying energy that has been a trademark of her sound since the Come days with subtle melancholia, melting together the roughness of her wonderfully smoky, raspy voice and her simple, yet very effective guitar playing with often dark touches of piano, viola, bass and drums, courtesy of her excellent band. Also last year, Zedek recorded the mini album SIX (Thrill Jockey), which showcases a sparser, somewhat bleaker sound and will be released to tie in with her most extensive European tour in years, starting in late February. But that's just the tip of the iceberg, as she explained when she sat down to answer our questions. LK: Thalia, where are you while you answer these questions and what is the vibe like? Thalia: I'm sitting in my apartment in the morning after a big snow storm last night and feeling grateful that I don't have to be outside in the extreme cold. We're having a crazy cold and snowy winter here in Boston this year! 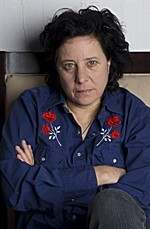 LK: What's it like to be Thalia Zedek at the start of the year 2014 and what is the biggest difference to say, 2001, when you made your first solo album? Thalia: I'm feeling really excited about a lot of things that I have coming up in 2014. First of all there is the release of SIX, a mini-LP that I am very proud of on Feb 25th on Thrill Jockey followed by a really extensive European tour starting Feb 28th. Also I have a new band called E with a couple of very interesting Boston musicians (Jason Sanford from Neptune and Alec Tisdale from Bad Man) and we'll be releasing a 7" single on the Absolutely Breakfast label in March. And I'm going to be doing some recording with Wrekmeister Harmonies at the Hotel Tu Tango in Montreal in mid-February which should be a lot of fun. So it's a very busy and productive time for me and it also is a time of a lot of collaborating with a lot of different people, which is quite a different place from where I was with my first solo album in 2001 (Been Here and Gone, Matador, 2001) when I was much more inward-looking. LK: I've recently read some comments about Via, where people were like: "This is amazing, I can't believe she never got more attention". I don't want you to pat yourself on the back here, but do you sometimes feel the same way or are you happy with the status you've achieved? Thalia: I feel really grateful that I've been able to make records and play shows for all this time, though like anyone else who does this type of work I have my moments of self-doubt. But playing music is what makes me happiest, so even though I want to reach as many people as I can I am really doing this for myself. LK: I really felt that Via was the record that you've been working towards with all your previous solo albums. Is that just me or is that a fair description? Thalia: I'm not sure that I would describe it exactly like that, but I do feel that it was a return to my roots in a way, in terms of the songwriting. The songs on Via incorporated some influences that I hadn't played with in a while, and I think the fact that I was working with a lot of different drummers might have left the songs with a more open feel to them. The drummer who did the recording, (Dave Bryson from Son Volt) also had a very relaxed, minimal and yet expansive way of playing, which allowed more room for the other instruments to breathe on this record. I think all of these things together make Via maybe a more cohesive sounding record than some of my previous ones. LK: How did your approach to songwriting change over the years? I suppose a lot of your 90s songs came from jamming and you were working with just two guitars/bass/drums. With your more varied (and often more expansive) sound these days - how much of a song's arrangement have you mapped before the first real rehearsal? For example, did you know all along that "Fell So Hard" would be a full band song and that "Afloat" wouldn't need much more than guitar and vocals? Thalia: For the SIX record I really wanted to do things a bit differently. I had actually already recorded a stripped down version of "Fell So Hard" as a bonus track for Via, but when I started playing it with the band it really changed the whole feel of the song so much that it's almost a different song now and really I loved it and wanted to record it that way! "Afloat" I had always imagined as a full band song, but I performed it by myself at a solo show in August and people seemed to really respond strongly to it. The response took me by surprise and I thought why not try recording it that way? We're working on a full band arrangement of it for the tour though. "Midst" will also probably become a full band song at some point. In terms of songwriting, I am usually hearing the whole band in my head when I'm writing but then I let everyone in the band come up with their own parts. They are such great musicians and can always come up with something cooler than I would on my own. In terms of arrangements I will have pretty much decided on where the verse and chorus etc will go on my own, but once I play the song with the band it sometimes will change. LK: Would it be right to say that you turn to more stripped down arrangements when you want the lyrics to take center stage or is that explanation too simple? Thalia: No, I think that is probably true to some degree. Playing with a viola, piano, bass and drums provides a very rich palette to choose from in terms of arrangements, but sometimes it can almost be too rich. Especially if everyone is playing on every song. So I do make a conscious effort to try and make sure that there is enough space left for the vocals, particularly on certain songs. LK: As much as I like your own songs, I've particularly liked your takes on other people's songs as well. I always wondered though: Do you approach songs written by your peers like Freakwater differently than, say, tunes by larger-than-life figures like Lou Reed, Bob Dylan or Leonard Cohen? Thalia: Thanks! I have always really enjoyed covering other peoples songs, and my approach is not at all influenced by whether or not they are famous or not. I try to be true to the feeling of the song, but not to try and imitate it. I play it as if it was a song that I wrote myself, but I do feel strongly about singing the original lyrics. LK: Quite a few songs on SIX seem to suggest that you still have a thing for a deliberately sparse sound as well, harking back to your early "solo" days. Did this happen by chance or did you have the idea to augment Via with a more stripped down "twin" in the back of your mind all along or how did the new record came along? Thalia: The new record came along when I was forced to postpone the European tour that I was supposed to do in November until this coming March. I was pretty disappointed not to be able to tour behind the Via record. Bettina at Thrill Jockey knew that I had some new songs kicking around and suggested that I record an EP instead and combine the release with a tour in March for both records. So I did kind of think of SIX as the "twin" of Via some ways, that's a great way of putting it, and hopefully they complement each other well. LK: The press sheet for SIX implies that the Come tour rubbed off on recording of the new songs. From your point of view - what were the most striking influences form that tour that you took to the recording of SIX? Thalia: I'm not sure if I can really see how the Come tour affected the recording of SIX other than the experience of playing with those Chris, Sean and Arthur again for so many shows gave me a real boost of confidence going into the studio. I hadn't toured like that in quite a while and it felt really really good! It definitely left me feeling energized and looking forward to making new music! LK: For last years' Come tour, you had a pretty strict agenda. For your upcoming tour of Europe you obviously have more choices. Especially since you're visiting many places where you haven't been in quite a while - what can we expect from these shows in terms of songs and presentation? Thalia: Our new drummer Jonathan Ulman is hard at work learning a bunch of the older songs. He knows all of Via and obviously SIX but by now we have quite a large repertoire of songs to choose from so we're still working that out. He will definitely learn enough so that we can play different sets every night. I'm very opposed to playing the same set night after night. Everyone in the band has given him a list of their favorites, so we will be switching things up quite a bit. It should be interesting! LK: More generally speaking: What do you like most about playing with a band and what are the advantages of playing solo? Thalia: I definitely prefer playing with a band to playing solo, though there are certainly some advantages to playing solo. Financially and logistically playing solo is a much more economical way to tour. And you can play whatever songs you want without worrying about if everyone will remember their part or knows the song. It also gives you access to venues that might not be able to host a full band. But if it was completely my choice I would always prefer to play with a band and I'm VERY excited to be able to do this tour with all of these guys who I've worked with for many years. LK: If you had the chance to design a venue: What would the perfect room for a TZ show look like? LK: Is being on tour - especially when it's a longer tour of Europe and not just a week up and down the East Coast - still an exciting prospect for you after all these years, an experience you get to enjoy or is all the traveling and visiting foreign places becoming just a means to an end: being able to play to people? Thalia: Absolutely, I love traveling, I love meeting new people and I love playing music so touring is something that I really really enjoy. Most musicians that I know really love to tour, maybe there's some kind of connection between music and travel that goes back to the wandering mistral. But touring is a very integral part of the whole music making process for me and if I go too long without it I start to feel very restless. LK: Maybe it's just the European perspective, but it seems that with two new releases under your own name, the Come reissue and two major tours you've been busier in the past 18 months than in quite some time. So is this the second coming of TZ? Thalia: That's a funny way to describe it, but I definitely feel really excited about playing and writing right now and I'm trying to do as much of it as possible. I've also got some collaborations coming up, I'm going to record a 20-minute piece with Wrekmeister Harmonies in Montreal in February and then there's my new band E that I told you about. I think I realized in the past year or so that it really energizes me to be involved in a lot of different musical projects as opposed to only the Thalia Zedek Band so it's been a really fun and productive time for me this past year and I'm hoping to keep things rolling on in 2014 as well!